A desiring mind seeks infinity, and finds it today in a proliferation of signals: electromagnetic waves beaming down from the skies, fiber-optic cables emerging from the seas, copper wires woven across the continents. The earthly envelope of land, air and ocean – the realm of organic life, or biosphere – is doubled by a second skin of electronically mediated thought: the noosphere. It’s a vast, pulsating machine: a coded universe grown complex beyond our grasp, yet connected at every pulse to the microscopic mesh of nerve cells in our flesh. Such is the contemporary circuit of communication. Its existence raises two basic questions. What will be the destiny of this intangible planetary skin? And how does it unfold in our own bodies? Picture yourself long ago, as a child, discovering the pairs of terrestrial and celestial globes that are found in the museums of the old European sovereigns. The room is inexplicably empty, and you, the child, chance on the twin rotating spheres with their intricate designs, clasped in heavy armatures of wood and brass. One of them sketches the contours of land and sea in meticulous detail, while the other paints extravagant fantasies over a map of the stars. But what is the relation between the continents and the constellations? Why give such rigorously equal weight to fact and imagination? What has the lion, the crab, the archer, the serpent, to do with the compass or the colonies? And why would the sovereign have wavered between the two? Seen from the child’s perspective, the terrestrial and celestial globes mark the split between a physical science of the territory and a free-floating realm of the imagination. The precisely drawn lines of latitude and longitude speak of exploration and conquest, of industry and trade; while the mythical figures of the celestial globe beckon elsewhere, toward mysterious constellations of universes. It was here, you might imagine, in this very room, that the geometric cartographer parted ways with the mystical astrologer. But wasn’t it also here that the highest task of the artist first emerged: that of giving form to the heavens, of rearranging the stars above our heads? The Renaissance saw the birth of modern science under the cloak of astrology; but it also saw the beginnings of world conquest by the Western sovereigns. Our own era of global expansion has seen the birth of a new science, cybernetics, which emerged along with America’s liberal empire in the course of the Second World War. Cybernetics established a remarkable faith in the power of information to make a difference, to change the fates of lives and nations. But it also generated unprecedented capacities for surveillance of the most minute behaviors of human beings. “Information is indeed ‘such stuff as a dreams are made on,’” observed an American social scientist in the early 1960s. “Yet it can be transmitted, recorded, analyzed and measured.”2 Information machines have become the elusive myth and the threatening master of human desire in the postmodern era. How does the myth of the machine exert its pragmatic effects, reinforcing the coercive functions of the social order? Mumford described Renaissance astrology as a “supplementary religion,” opening the way to a clockwork vision of the universe and a mechanistic organization of human existence. Working along similar lines, Deleuze and Guattari use the concept of overcoding to describe the process whereby singular human actions are integrated to dominant social structures. Overcoding is first of all a linguistic notion: it designates the syntactic articulation of a material substrate, giving rise to “phenomena of centering, unification, totalization, integration, hierarchization, and finalization.”3 The overcode is the signifier of structuralist theory, the abstract unit of language that cuts out standardized concepts and organizes them according to binary oppositions (raw/cooked, man/woman, friend/enemy etc). But structuralism treats language as a normalizing function, a master-code imposing itself on singular styles of behavior and speech. As Guattari wrote in one of his solo texts: “Only the use of a more general language that overcodes all the local languages and dialects makes it possible for an economic and state machine to seize power at a more totalitarian level.”4 Thus the linguistic notion reveals itself to be fundamentally political. For Mumford, the megamachine finds it origins among the ancient Pharaohs, worshipers of the Sun God Atum-Re. The power that built the Pyramids is not any single technology, but a social order that subsumes entire populations, “an invisible structure composed of living, but rigid, human parts, each assigned to his special office, role, and task, to make possible the immense work output and grand designs of this great collective organization.”6 It reappears under new guises in the modern era with the absolutism of the Sun King Louis XIV, before reaching its twentieth-century apotheosis in the totalitarian regimes of Stalin and Hitler. But Mumford also saw the American technocratic system under which he lived as a megamachine, able to trace out in advance the “collective statistical probabilities” of a diverse and populous nation. Its essential components were an all-powerful wartime President (or commander in chief) and the devastating artificial sun of atomic weapons. Only after the Second World War were its full imperial dimensions attained, through the economic restructuring of Europe under the Marshall Plan, the conquest of orbital space through the moon-shot program and the multi-pronged “containment strategy” directed against the Soviet Union. Deleuze and Guattari give a date for their first encounter with this latest configuration of the megamachine: November 8, 1947, one year after the promulgation of the Truman Doctrine offering military support against communist insurgencies, and only a few months after the speech announcing the Marshall Plan. This was the day of the radio broadcast of Antonin Artaud’s most radical performance, To Have Done with the Judgment of God – a poetic revolt against the overcoding of body and mind by the advancing armies of organized commerce and industrialized war. What Artaud proposed in response to the megamachine was a “body without organs”: a smooth slippage of flesh without grasp for the robots of battle, and an exit from the geopolitical map of the Cold War. The broadcast never happened: it was censored by the French government. How can we escape from the subtler encoding machines that would scan our neuronal mesh at the molecular level, and synchronize it with the algorithms of computers? The flexible economy confronts us with the paradoxical trap of our own freedoms. What I’d like to do with the help of Guattari’s later works is to spark off some conversations about the models of existence that we bring into play, in hopes of leaving behind the dominant patterns that shape our destinies. The question is how you rearrange the stars above your head, to open up unexpected paths on the ground beneath your feet. Guattari took the perspective of an artist and an activist, seeking an ethico-aesthetic paradigm. He explored all the technologies of his day and laid the theoretical and practical basis for the wildest media experiments of the 1990s, even while carrying out a fundamental critique of information science and its applications in the capitalist societies. His aim was to appropriate the powers previously ascribed to myth, in order to reconfigure the articulation of bodies and machines (the relations of biosphere and noosphere). This was the desire of the Schizoanalytic Cartographies: to provoke fresh intersections of artistic constellations, existential territories, social flows and abstract ideas. Not a map of positions and probabilities, but a set of vectors whereby the virtual and the actual come to meet. A cartography of escape routes leading beyond the black holes of neoliberal control, toward the possibility of collective speech. First of all: how did Guattari conceive of the individual’s relationship to the neoliberal economic order as it began taking form in the 1980s? Where did his cartographic concepts come up against the engineering practices of cybernetics? And what, for him, were the fundamental micro and macropolitical questions of the new world system? His late work begins with a lecture entitled “Integrated World Capitalism and the Molecular Revolution,” delivered in 1981 shortly after the publication of A Thousand Plateaus.8 At stake here is a psychosociology of power and liberation, in an era when the geopolitical rift between the capitalist West and the communist East was already on the wane and an “immense reconversion” had begun, ultimately leading to the installation of similar technologies, organizational forms and models of desire across the face of the earth. How could “new kinds of revolutionary machines” be assembled in this environment, drawing on the mutations of subjectivity and desire that were stimulated at the heart of the productive apparatus? And how could these “molecular revolutions” be brought into articulation with the traditional workerist struggles that had been neutralized and absorbed into the consumer system? These were the gnawing questions that presided over all the breakthroughs and innovations of Guattari’s final period, up to his untimely death in 1992. The computer revolution considerably accelerates the process of integration, which also spills over into unconscious subjectivity, both individual and social. This machinic-semiotic integration of human labor implies that the mental models of each worker must be taken into account in the productive process: not just their knowledge (or what some economists call their “knowledge capital”), but all their systems of interaction with society and the machinic environment. The key concepts of this far-seeing text are modeling and machinic-semiotic integration. The word “modeling” designates the simulation of dynamic systems, typically carried out by the application of strategically formulated computer algorithms to data-inputs gathered by scientists (which can be social scientists, psychologists, market researchers and so on). This kind of modeling has become essential to the planning of what Guattari called “collective facilities,” which increasingly take the form of privately owned consumption environments, like the commercial mall whose design process has been recorded and analyzed in precise technical detail by the filmmaker Harun Farocki in a remarkable video entitled The Creator of Shopping Worlds.10 The model is therefore a system of effective signs, a “cartography” conceived not as a mere representation of an existing or ideal human environment, but rather as an active, diagrammatic force (“where the sign systems enter into direct concatenation with their referents, as instruments of modeling, programming, planning of social segments and productive assemblages”). The phrase “machinic-semiotic integration” refers to what actually happens when such a cartography is constructed in three dimensions, as the material prolongation of the data-gathering and simulation process. It describes how the functional capacities of the architecture can be programmed with specific contents, qualities and characteristics, so as to elicit and transform the semiotic expressions of the users, which for Guattari are not limited to verbal language but include affects, gestures, patterns of movement and so on. Machinic-semiotic integration occurs when those individual expressions actually refine and prolong the purposes that have been coded into the built environment. Integrated world capitalism therefore implies the cybernetic inclusion of the creative operator within a complex, ever-expanding machine – a process, not of molecular revolution, but of systemic entanglement. There is obviously a good deal of truth to such pronouncements, as every page of the essay on “integrated world capitalism” confirms. Still Guattari revolted against Baudrillard, critiquing the subterranean influence of “reductionist concepts spread immediately after the war by information theory and early research in cybernetics,” whose hasty absorption by postmodern thinkers “put us far behind the phenomenological research that preceded them.”14 What he proposed in response to this pure reiteration of the status quo was not a refusal of technology or a retreat from machinic complexity, but a shift from the binary logics of information theory to a more heterogeneous matrix of interactions, including the trans-subjective phenomena of a “pathic subjectivation” that the cybernetic sciences had never been able to compute. Here lay the promise of the molecular revolutions, whose psychic and libidinal dynamics lay at the heart of integrated world capitalism and its “intensive imperialisms,” but whose existential contradictions were ultimately irreducible to the procedures of integration and control. At stake was an escape from the transparency that Baudrillard denounced, and a rediscovery of the inherent contradictions whose expression could open up a pathway toward other human beings in their fundamental alterity and their own self-division. On the one hand, this would entail a deliberate reflection on the models that each person brings into play. But it would also require a deep rethinking of the concept of system. For decades, the cyberneticians had relentlessly sought to extend the boundaries of systemics, which, as Von Foerster pointed out, is a word based on the Indo-European phoneme sys, meaning to join, to integrate.15 In the age of integrated world capitalism, Guattari would be drawn toward quite different conceptual frontiers, the ones marked by the phoneme skei, which means to separate or cut – as in science, of course, but also in schism or schizophrenia. How could a dissociation – a schiz – become the basis for a better society? In December of 1980, in the opening remarks of a seminar that would run throughout the decade, Guattari wondered aloud if the time was finally ripe to leave behind a strictly critical approach: that of the Anti-Oedipus. “Was it conceivable to envisage a methodological perspective, trying to account in a different way for practices of intervention, of therapy, of psychoanalysis?”16 The answer to this question would become the Schizoanalytic Cartographies. The seminar was launched in dialogue with Mony Elkaïm, the Moroccan-born, Brussels-based psychotherapist whom he had first met in a Porto Rican neighborhood of New York.17 What gradually emerged from this dialogue was a series of diagrams pointing to four domains of the unconscious, four interrelated varieties of experience that overflow the ego to constitute an expanded field of trans-subjective interaction. Each zone of this fourfold map is understood not as the definitive structural model of an unconscious process, able to render its truth or meaning, but rather as a meta-model, a way of perceiving and perhaps reorienting the singular factors at play. “What I am precisely concerned with,” Guattari wrote, “is a displacement of the analytic problematic, a drift from systems of statement [énoncé] and preformed subjective structures toward assemblages of enunciation that can forge new coordinates of interpretation and ‛bring to existence’ unheard-of ideas and proposals.”18 What he was concerned with, in short, was the articulation of collective speech. 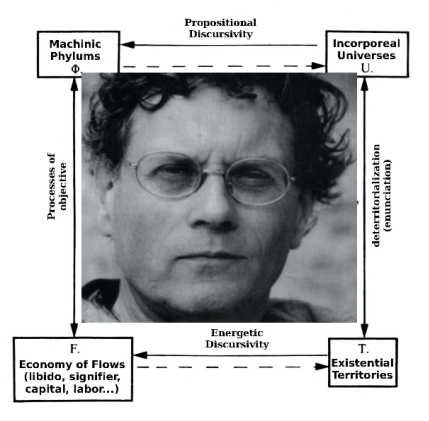 Guattari points in exactly the direction that would be taken by social movements, toward “new kinds of revolutionary machines.” Self-modeling within the confines of the contemporary information system was achieved in myriad ways by the explosion of artist-activist practices after the Zapatista uprising of 1994, revealing the acuity of his vision. Indeed, all the artistic and activist projects I have focused on in this book can be approached through the lens of his writings. Yet what remains insufficiently understood, even by media tacticians working directly with computerized tools, is the degree to which his theoretical trajectory forms a response to the reductionism of the postwar cybernetic paradigm, whose entry into structuralist psychoanalysis he directly witnessed in the seminars of Lacan in the mid-1950s22 and whose far-reaching consequences he would encounter some two decades later in the “systemic therapy” practiced by Mony Elkaïm. The book could be seen as a culmination of the “order-from-noise principle” proposed by Heinz von Foerster as far back as 1960.29 Both Prigogine and Stengers were chemists, concerned with material metamorphoses. Their key concept was that of phase changes at the molecular level of organization, where the introduction of heat energy pushes a liquid beyond its state of equilibrium, giving rise to patterns of turbulence or “dissipative structures” from which a new order emerges. Important to this description are moments of bifurcation, where the departure points of new pathways are set by chance. What this meant philosophically was the overcoming of the atemporal outlook characteristic of classical physics, which deduced every movement of a system from the characteristics of an initial state existing independently of the observer. Strange as it may seem, change in the classical model could only be conceived as entirely reversible: energy did not dissipate and the fundamental identity of physical bodies was conserved. From the new perspective time appeared irreversible and the observer was understood to be inseparable from its evolution over thresholds of more-or-less radical discontinuity. For the theorist of micropolitical transformations, who saw the singularities of small-group breakthroughs as catalysts for larger social movements, such a model could only come as a huge encouragement. If matter itself could be disorganized by an influx of energy to the point of bringing forth an entirely new equilibrium, why not imagine that the passivity and conformism of societies – or worse, their pathological regressions toward authoritarianism – could be thrown into chaos by the introduction of disruptive and paradoxical elements, whether linguistic, aesthetic, philosophic, sexual or machinic? Why not imagine that the “steady states” of industrial society, and indeed, the repressive state itself, could dissipate into open potentials for new ways of living? Such ideas are quite tantalizing, because they promise an expanded historical role for relatively small-scale experiments in collective cooperation and self-organization. But they too have to be placed in their socio-economic context. The 1980s were the inaugural decade of neoliberalism, which brought new forms of financialized wealth-creation and motivational management into play, alongside the militaristic technologies of surveillance and control that had been inherited from the Cold War. A vast expansion of the semiotic economy – that is, the economy of images and signs, detached from any referent in reality – gave immense powers to those who could manipulate mathematical models of behavior and shape new environments on the basis of their analyses and simulations. The theories of complexity and chaos were highly productive at the end of the twentieth century. They restructured the terrains that emancipatory movements would have to occupy and radically alter, in order to bring forth singular desires from cracks in the dominant paradigm. Here I want to rapidly list some of these theories, just to give an impression of the times, without inquiring into Guattari’s specific knowledge of each development. In 1979 the American economist W. Brian Arthur began a series of investigations that would revolutionize general equilibrium theory, which traditionally held that overproduction would always be corrected by falling prices. He proposed instead that the positive feedback of rising sales could lead to new investment, spiraling growth and increasing returns on production, particularly in industries based on unlimited knowledge rather than on scare material resources.30 In other words, there would be no necessary limit to profitability. Fifteen years later, Arthur and the complexity theorists of the Santa Fe school would become the gurus of the “new economy.” Also in the course of the 1980s, news began filtering back to the USA and Europe of the Japanese kanban or “just in time” production system, which reoriented the automobile industry from the “push” of demand forecasts to the “pull” of actual sales, tabulated at market and relayed instantly back to the factory.31 These information flows would at last begin providing real-time numbers for the computer modeling of feedback loops in industrial production, pioneered in the 1960s by the American engineer Jay Wright Forrester.32 The prestige of Japanese methods was accompanied by the exportation and adaptation of kaizen management techniques, which demanded the active implication of workers as shop-floor inventors and problem-solvers. In the West, this would lead to a new emphasis on “human capital” and to major investments in the analysis and modeling of psychological and relational processes for the improvement of productivity.33 Every aspect of society had to be retooled for quick response to market signals. The subjection of industrial workers to rigid disciplinary models, codified by Frederick Taylor in the early twentieth century, would gradually be replaced by the subjectivation of prosumers seduced into action by the new possibilities of miniaturized, ergonomic technologies. The late 1980s were the golden age of junk bonds, which helped inflate the unprecedented stock market bubble of 1987. As in recent times, one could witness the radical constructivism of human beings interacting directly with their own symbolic creations (stocks, bonds, derivatives). During this same period, the fractal geometry of Benoît Mandelbrot with its proportional transitions from micro to macro scales – which had been used to define the expansive characteristics of “smooth space” in A Thousand Plateaus – began to be adopted by traders as a way to chart the contours of turbulence in the computerized financial markets.34 Interpretations of postmodern society multiplied along with “exotic” financial instruments. As the geographer Nigel Thrift has shown in a brilliant essay, chaos and complexity theories began to circulate as a new kind of governmental logic (or governmentality) in the the course of the 1990s.35 Already by 1992, Brian Arthur could write: “Steering an economy with positive feedbacks into the best of its many possible equilibrium states requires good fortune and good timing – a feel for the moments when beneficial change from one pattern to another is most possible. Theory can help identify these states and times, and it can guide policymakers in applying the right amount of effort (not too little but not too much) to dislodge locked-in structures.”36 The most sophisticated versions of chaos theory and second-order cybernetics were immediately applicable to the turbulent developments of the post-industrial economy. In a short text entitled “Models of Constraint and Creative Modeling” (1991), Guattari observes that “the control society is dominated by a kind of collective deterministic drive which, paradoxically, is nonetheless undermined from within by an imperious need to preserve minimal degrees of freedom, creativity and inventiveness in the domains of science, technology and the arts, without which the system would collapse into a kind of entropic inertia.”37 The analyst of overcoding was totally lucid about the mainstream uses of the chaotic transformations sketched out by Prigogine and Stengers. He was fully aware that the contemporary megamachine had taken on increasingly sophisticated forms, profiting from carefully managed ambiguity. The fundamental question for a revolutionary was that of steering the molecular forces away from their normative patterns. But who exactly would do it? The only guidelines could be found in a respect for heterogeneous singularities which did not add up to any modelizable system, and in a striving for autonomy from the fundamental axioms of integrated world capitalism. The Schizoanalytic Cartographies are oriented from start to finish by one of Guattari’s oldest ideas as a therapist and political activist, developed under the influence of Jean-Paul Sartre. It concerns the passage from a “subjected group,” alienated by social forces, to a “subject group,” capable of formulating its own statements.38 However, the Sartrean notions of individual choice and undivided responsibility for one’s own actions now appeared too restrictive and linear, from a systemic viewpoint where the range of possible statements is determined by the basic parameters of the system. The passage of transformational thresholds became the leading issue. Through the meta-modeling of chaotic processes and perhaps even more, through pragmatic experimentation with the material and semiotic components at play within such processes, groups would better understand how to move themselves toward moments of bifurcation. At best, they would know how to embody the opaque and incalculable element of chance that inflects the development of an entire system. The relation of biosphere and noosphere returns in this text, like a geophilosophy of humanity seeking a new compass. Guattari speaks of “ecosophic cartographies” developed by social groups that are able “to postulate a human meaning for future technological transformations.” At issue is the steering function of society, which cybernetics tried to automate through the application of feedback loops. Yet no universal truth or teleological principle is offered in replacement for cybernetic governance. The ecosophic groups were to remain inherently singular: “Each ‘cartography’ represents a particular vision of the world, which, even when adopted by a large number of individuals, would always harbor a core of uncertainty at its heart. That is, in truth, its most precious capital; on its basis, an authentic hearing of the other could be established.” The core of uncertainty at the heart of each cartography offers an instance of dissociation that resists what Baudrillard called the “transparency” of contemporary information societies. Now I will explore the ways that this resistance comes into play on existential territories. What I “see” in this phrase – as if in a painting – is an image of the sensation it provokes within me: an assemblage of self and surroundings where pathic interiority is traversed by external components that carry it to the threshold of language. The schiz is palpable since the affect is shown spilling over from the atmospheric surround, destabilizing the ego and opening up a chaotic void in subjectivity, which can either resolve itself into verbal expression or sink into a black hole of anxiety. The moment of trembling between affect and expression is the departure-point of the Cartographies. Yet what the fourfold diagrams try to map out are not just the latencies and possibilities of speech on the edge of an all-absorbing trance, but also the material situations and logical problematics that draw subjectivity out of its chaos, into unfolding social flows and projects which are themselves reshaped through their interplay with the ceaselessly mutating operational diagrams that Guattari calls “abstract machines.” The affective pulse that leads from territorialized subjectivity through social flows to the relation with abstract machines is the heartbeat of the Schizoanalytic Cartographies. What the book tries to show is not how behavior is structured in adaptation to its context – because every discourse of power does that – but instead, how people are able to leave their initial territories and articulate original expressions in problematic interaction with others on a multiplicity of grounds, so as to resist, create, propose alternatives and also escape into their evolving singularities, despite the normalizing forces that are continually brought to bear on them by capitalist society. Where cybernetic engineering programs a determinant goal directly into the circuits of a machine, and systemic analysis deduces a functional model of purpose from the fit between an organism and its environment, the Schizoanalytic Cartographies map out the existential and social parameters within which a desire comes both to problematize itself in thought and to release its otherness in expression – thereby helping to create a new context and to launch a new cycle of transformations. To do this meant squaring the processual circle of existence, or analyzing what Guattari calls the plane of consistency, in order to distinguish four domains that subtend any possible awareness and can therefore be considered as varieties or models of the unconscious. Analysis, or the process of splitting – the schiz itself – is merely another way of describing the movement of deterritorialization that brings the four domains at least partially to consciousness. Any of the fields can be a source or a stimulant of this deterritorialization; thus the domains are called “functors,” to indicate their transformative effects on the assemblage whose overall dynamics they initiate and sustain. The map of the functors appears two dimensionally as four separate fields organized into a square, or three dimensionally as a set of vertical planes arrayed in a circle and traversed by arrows of time. Taking the square presentation, we can begin at at the upper right corner with Universes of reference or of value (U), then proceed down the right-hand axis to the existential Territories (T). At lower left we find the domain of material and energetic Flows (F), while the upper left corner is occupied by the Phyla of abstract machines (Φ). What’s being sought are the interrelations between these four heterogeneous domains: the self-referential dimension of aesthetic qualities (form, color, rhythm, tone, intensity); the body with its sensible experience (grasping, becoming, anxiety, ecstasy); the social world of things, energies and signs (institutions, projects, constructions, conflicts); and the conceptual realm of ideas (logic, diagrammatism, invention, reflexivity). The cycle of relations follows an order, and the adjacencies between the domains are significant. But we could equally well begin with any of the four functors and follow the cycle in either direction, to generate a differently inflected analysis of the dynamics at work in a given assemblage. As one might guess, there are other, still more intricate relations between the domains, many of which I will only touch upon in what follows. The text of the Schizoanalytic Cartographies is highly abstract, borrowing freely from the sciences and from mathematical formalisms. It is also highly condensed, proceeding without examples or illustrations. To this extent it tends to remain in the upper left-hand quadrant, among the rhizomes of the machinic phyla. As Anne Querrien has remarked, the book has not yet found its readers; it is awaiting “translation” (and even translation into French, she claims).41 In its own terms, it is awaiting components of passage toward the other three domains. These transitional elements are partially supplied by the texts of Chaosmosis, which are based on the fourfold cycle; but it is also up to readers and users to “fill out” the meta-models with their own experience. So rather than merely reiterating the logical constructions of the Cartographies, what I will do now is to explore these complex diagrams in a more evocative way, borrowing extensively from Chaosmosis but also interjecting other images, other transitional components. The movement through the cycle of assemblages will begin at bottom right, with the ground beneath your feet – the singular ground of subjective reality that is missing from the “mirror worlds” of second-order cybernetics and its radical constructivism. Guattari speaks of existential territories. Where do you feel familiar, at home, what paths do you retrace without thinking? This is a realm before or beyond signification, it’s about an animal’s touch with the land, sheer sensibility, where language collapses into skin. The territory is your living space, your cruising range, your neighborhood or worse, your fortress, your bottomless black hole. It’s the experience of pacing, of wandering, like a dog in the back yard, like lovers on a bed or teenagers on the street, like a baby exploring the body of the mother. The territory is the object of an “existential grasping” whereby an inchoate subjectivity tries to hang onto something, to mark off a boundary, to open up a world. But this territory is only virtually real: it opens up the space for an existential choice of materials, it provides the substance of expression. Guattari was touched by the psychotherapy of Fernand Deligny, who took care of autistic children on a farm in the hills of the Cevennes in southeastern France. The autistic children do not speak. To give the therapists something else to do, to distract their attention, Deligny had them trace out maps of the children’s paths over the landscape. These are sensitive documents: meshworks of accumulated pathways unfurling toward points of attraction, zones of lingering and wordless interest for the children, superimposed over a territory that we do not see. Deligny spoke of the children’s paths as wanderlines, “where the halts, returns, hesitations and loops respond to invitations at once real and imaginary, decoded, opening into constellations and not fenced into a system.” And he wrote this: “The real work of the maps, the difficult thing, is to retrace the wanderline of a kid and see that it escapes us, that we can’t begin to grasp what this kid’s intention might be – and to realize that the wanderlines are magnetized by something.”42 But what could it mean to be the very needle of the compass? The territory is the virtually real, the material place where subjectivity emerges. But it cannot be understood, and indeed, no word can be spoken, without the deterritorialization that precedes it and gives it form. To move forward then, into the social domain of material and energetic flows, is already to feel the transiting desire of incorporeal universes: fragments of music, poetry, images, which return rhythmically to your imagination in the form of refrains, blocs of disembodied artifice. Guattari speaks of “universes of reference or of value.” What returns is the difference of aesthetic intensities, which might be laser lights, Renaissance painting, Chinese characters or raw graffiti sprayed directly into the urban beat. Their patterning is not experienced as the calculated difference of code, but as the pulsing concatenation of rhythm. The presence of an elsewhere is nothing you can possess, nor does it possess you: instead there is a kind of tearing in the territory of being, an intimate dehiscence, like curtains of sensation parting in the wind. Perhaps no artistic gesture has better expressed this than Lucio Fontana’s rhythmically repeated slashes into the textured color of an egg-shaped canvas, in the series of paintings entitled Fine di Dio. Using a similarly punctuated image (“the Dogon egg”) Deleuze and Guattari evoked the latency and fullness of the body without organs. It is a feeling of presence and absence, of oscillation, the elusive capacity of being in two places at once: the virtually possible, which carries you beyond the familiar territory and into realms of the unknown, toward expression. The field of subjectivity constituted by the two right-hand elements, speechless territory and disembodied universes, is something like the “autopoietic machine” described by the biologist Francisco Varela: an autonomous cell, a living organism that constitutes its own organizational pattern and continually reproduces the material components in which that pattern is embodied.43 Guattari speaks of a condition of intensive self-reference, a state of “self-retroaction” or positive feedback which produces subjectivity in itself. But if he notes a difference from Varela, the reason is clear: because the mobilizing element of the subjective pole comes from outside the organism proper, from disembodied constellations of universes; and it persists beyond the autonomous organization, allowing its passage through mortal time and its evolution over generations. The realm of the virtually possible is therefore constitutive of the pathic core of territorialized existence. It alone can give rise to the “nuclei of mutant subjectivity” described in Chaosmosis: “We are not in the presence of a passively representational image, but of a vector of subjectivation. We are actually confronted by a non-discursive, pathic knowledge, which presents itself as a subjectivity that one actively meets, an absorbent subjectivity given immediately in all its complexity.”44 This connection or even momentary fusion with the virtual is what makes existence on the territory overstep itself, becoming productive in the objective sense and opening up to the complexity of material-energetic flows and abstract ideas. Clearly, this kind of transition does not only apply to the psychotic sufferer, but also to the corporate workaholic glued to the screen, to the credit-spree consumer immersed in a fantasmatic “shopping world,” or indeed, to anyone trapped on the constrictively stabilized territories of contemporary capitalist culture. The opening might be artistic, but it might also be a break in the routine, an objection of conscience, a strike, an improvised revolt on the streets, or whatever pierces the curtain of normalcy and reveals the existence of other possible worlds. These punctual outbreaks are the sites from which “transferential grafts” can be taken, destabilizing neighboring assemblages and precipitating new flows. The co-management of the “treatment” then devolves to social movements and participants in dissident aesthetic or political projects, breathing the fresh air of massive demonstrations or the rarefied atmospheres of experimental workshops and collaborative devices for the reconfiguration of the intellect, the imagination and the senses. In the age of predatory environments and generalized simulacra, such contestatory projects, inseparably artistic and political, can aspire to the status of a therapeutic “cure” for a sick society, disentangling self-motivated minorities from the toxic conditions of life under today’s political-economic rules. At stake in these material and energetic flows is an extension and multiplication of the subjective territory, a deterritorialization that alone produces the actually real dimension of coexistence. The resulting step outside the merely virtual or fantasmatic self is what allows the displacements initiated by the constellations of aesthetic refrains to take on a problematic, mobile consistency, itself continually reworked and complexified through its relations to the machinic phyla. This last category indicates the realm of abstraction, of rhizomatic concatenation and intricate coding, but above all of paradigm shifts and the irreversible decoding that attends any scientific or philosophical breakthrough. Therefore the machinic domain does not refer to any concrete, really existing machine: it is not technology itself, but rather the diagram of forces that precipitates it into form, then dismantles it again at a moment of rupture. The machinic phyla mark out the realm of the actually possible, continually provoking real bifurcations in the existing patterns of social circulation and initiating new departure points that leave the old machines behind like so much junk in the dustbin: decoded raw materials, aestheticized antiquities or jealously guarded and frozen territories turning inward on themselves like black holes. Yet inertia never triumphs and the realm of the actually possible continually asserts itself as the negentropic principle of social existence: everything around us has already changed, history has broken its course and renewed its march once again. The dynamic relations between the concrete forms of social circulation and the mutating rhizomes of ideas are what reveal the capacity of Guattari’s meta-model to embrace the full complexity of contemporary existence, marked by ceaseless innovations in science, philosophy, law, organizational theory, mathematics, cosmology – everything that transforms the lifeworld irreparably, calling for new images of existence and new existential territories. Seen from this angle – or approached from this direction in the movement through the cycle of assemblages – the machinic phyla appear to initiate the heterogenesis of the social order. Simply inexistent before their emergence as a transformative force, they constitute a non-dialectical otherness, appearing without confrontation or struggle to dissolve the stability of human assemblages, which they project toward distant futures. They redraw the map of existence, transforming the plane of consistency and thrusting us further into the unknown. Like those modernists who believe in the ineluctable progress of science, Guattari sometimes ascribes an absolute status to the recombinant productivity of the machinic phyla. The virtual then appears as an inexhaustible reservoir of proliferating invention, like an all-powerful hand of God extending down from the heaven of ideas to the world. Yet the technical discussions of the Cartographies end in a quite different fashion, by detailing a process of “enunciative recursion” which follows the opposite path around the cycle of assemblages. It is by reaching in the other direction, from the complexities of the social predicament through the necessity of existential grounds into the aerial mobility of aesthetic images, that discoveries are made: new concepts, new formulas, new diagrams of possibility. Einstein himself, in Switzerland during the chaos of the Great War, inventing the theory of relativity that would break up the edifice of Euclidean geometry, had to pass through the image that we all still retain in our memories and our senses: the image of a man on a moving train, observing from his own curve of experience the velocities of others on other moving trains. Speech in the strong sense – symbolic inventions that shake up the existing order – always begins in the uncertainty of social situations, amid the shifting realm of material and energetic flows. Yet to cohere in original forms it always finds singular voices and bodies at grips with existential territories; and it always transits toward the productivity of code through the immaterial density of images, through sensible intensities that appear on the horizons of experience like unheard-of constellations. Guattari’s most powerful insight in the Schizoanalytic Cartographies was that individual bodies and aesthetic intensities play essential roles in the generation of collective speech, which when it finally appears is impersonal, rhizomatic, the voice of no one. To speak is to produce this singular pulsation of social experience: to create another world. Guattari’s writing is linked with May ‛68 and the crisis of the 1970s, when anarchic elements of individual desire emerged to disrupt the regimentation and standardization of the postwar industrial boom. Yet throughout the period, he and Deleuze were acutely aware of the systemic adjustments tending toward the flexibilization of labor and the financialization of the economy. While continuing to develop the emancipatory potentials of the “molecular revolutions,” they anticipated the ways in which the mobility, life energy and imaginative capacity of liberated individuals would gradually become entangled in the pulsating networks of the control society, constituting a self-reflexive diagram of power on the micro and macro scales – a megamachine of the second order, which integrates our bodies to far-flung informational circuits. What is happening now is the crisis of this vast machine, whose ultimate target has always been the atomized individual of liberal theory, conceived and modeled as homo economicus. The interest of Guattari’s late work is to sketch out the ontological grounds and the modes of deterritorialization that allow trans-individual subjectivities to gain consistency within, against and outside the global networks. It is clear that art took on an increasing importance in his conception of political action, not in the romantic sense of a transcendent or mythical figure capable of imprinting its destiny on the passive substance of a people, but instead as a kind of psychic shifter, enabling the passage from bounded existential territories to the social worlds of interconnected flows, and serving as a kind of fuzzy translation between the necessary embodiment of voice and the infinite proliferation of abstract ideas. Aesthetic experience is recognized in its intrinsic or even ineffable qualities and is welcomed as a moment of irreducible singularization; yet it is also understood to produce discursive, technological, philosophical and societal effects in its passage through the adjacent domains of existence. The result is that art is neither instrumentalized or explained away as a symptom, nor is it set apart from politics and society as a domain of pure creation/revelation. To be sure, in Deleuze and Guattari’s final co-written work, What Is Philosophy?, the specific locus of art is identified as the plane of composition, producing the constellation of a sensible universe.48 But rather than isolating this artistic function, the Schizoanalytic Cartographies reveal the dynamic relations of territories, flows, rhizomatic ideas and perceptual/affective intensities, inviting us to the composition of a processual map whose vocation is to become a sharable territory. For Guattari, cartography itself is an ethical-aesthetic act that provokes an event of existence. Here, it seems to me, lies the political significance of his late work, which has been intuitively grasped by a multitude of activist groups using cultural forms as vectors of organization and action in an irremediably complex and deterritorializing world. The question is whether broader emancipatory movements will now arise to give these existential possibilities embodied presence and effective symbolic translation amid the current crisis, at a time when the dominant maps are being swept away without anything yet emerging to replace them. If cartography has been a key metaphor for so many movements over the course of this last decade, it is because the hyperinflation of capitalist values, the resurgence of naked imperialism and the onrushing ecological collapse have brought about a generalized disorientation and a change in the very coordinates of change, leaving behind devitalized images in the arts and “zombie categories” in the sciences, as the sociologist Ulrich Beck recently put it.49 But what even the best sociologists do not seem to understand is that new coordinates cannot just be deduced from a purely intellectual analysis of the totality of the world-system, however “cosmopolitical” it is claimed to be. They have to be invented in a rupture from its existing state, or better, from its illusory continuity. This act of collective invention is the preeminent use of the noosphere, with its proliferation of pulsating signals. And so at the end of a long journey we enter the echoing chamber once again, with its terrestrial and celestial globes still enclosing their undiscovered meanings. This time the lingering presence of the sovereign seems to have finally disappeared. But the link between the two spheres is all the more visible. Where is the art that will rearrange the stars above our heads? And the science that will shift the ground beneath our feet? 1Lewis Mumford, The Pentagon of Power: The Myth of the Machine vol. 2 (New York: Harcourt Brace Jovanovich, 1964), pp. 31-32. 2Karl W. Deutsch, The Nerves of Government: Models of Political Communication and Control (New York: The Free Press, 1966/1st ed. 1963), p. 83. 3Gilles Deleuze and Félix Guattari, Mille Plateaux: Capitalisme et schizophrénie vol. 2 (Paris: Minuit, 1980), p. 55. English translation by Brian Massumi, A Thousand Plateaus: Capitalism and Schizophrenia (Minneapolis: University of Minnesota Press, 1987), p. 41. All translations of Deleuze and Guattari have been reviewed and occasionally revised on the basis of the French texts. 4Félix Guattari, “Sens et pouvoir,” in La Révolution moléculaire (Paris: Recherches, 1977) pp. 307-8. English translation by Rosemary Sheed, “Meaning and Power,” in Molecular Revolution: Society and Politics (Harmondsworth: Penguin, 1984), p. 169. 5Deleuze and Guattari, Mille Plateaux, op. cit., p. 533 (English trans. pp. 427-28). 6Lewis Mumford, The Myth of the Machine: Technics and Human Development (London: Secker & Warburg, 1967/1st ed. 1966), p. 189. 7For the quotes in this and the following paragraph, see Deleuze and Guattari, Mille Plateaux, op. cit., pp. 570-75 (English trans. pp. 456-60). 8Felix Guattari, “Le Capitalisme Mondial Intégré et la révolution moléculaire,” lecture delivered in 1981 at the CINEL (Centre d’Information sur les Nouveaux Espaces de Liberté), online at http://www.revue-chimeres.fr/drupal_chimeres/files/cmi.pdf. All quotes from this text are my translations. 9See Folker Fröbel et al., The New International Division of Labour: Structural Unemployment in Industrialised Countries and Industrialisation in Developing Countries (Cambridge: Cambridge University Press, 1980/1st German ed. 1977). 10Harun Farocki, dir., The Creator of Shopping Worlds, 2001. 11See Heinz von Foerster, “On Constructing a Reality” (1973), in Understanding Understanding: Essays on Cybernetics and Cognition (New York: Springer, 2003). 12Herbert A. Simon, Sciences of the Artificial (Cambridge, Mass. : MIT, 1996; 1st edition 1969), pp. xi and 11-12. 14Félix Guattari, Cartographies schizoanalytiques (Paris: Galilée, 1989), p. 57; English translation of this section by Todd Dufresne, as “The Postmodern Impasse,” in Gary Genosko, ed., The Guattari Reader (Oxford: Blackwell, 1996), p. 111. 16Félix Guattari, “Presentation du séminare” (Dec. 9, 1980), p. 1; available at http://www.revue-chimeres.fr/drupal_chimeraes/files/801209.pdf. 17Cf. Mony Elkaïm, “Schizoanalyse et thérapie familiale : Ce que j’ai appris de Féliz Guattari,” available at http://www.therapie-familiale.org/resonances/pdf/monyelkaim.pdf. 18Félix Guattari, Cartographies schizoanalytiques, op. cit., p. 28. 19Interview with Guattari by Jacques Pain, “Institutional Practice and Politics,” in The Guattari Reader, op. cit., p. 122. Apparently this was originally published in Jacques Pain, ed., Pratiques de l’institutionnel et politique (Vigneux: Matrice, 1985). 20See Félix Guattari, “Des millions et des millions d’Alice en puissance,” in La révolution moléculaire, op. cit. [English trans., “Millions and Millions of Potential Alices,” in Molecular Revolution, op. cit. ], and Bernard Prince and Emmanuel Videcoq, “Félix Guattari et les agencements post-média: L’expérience de Radio Tomate et du Minitel Alter,” in Multitudes 21 (September 2005). 21Felix Guattari, “Vers une ère post-média” (1990), in Chimères 28 (Spring-Summer 1996), pp. 5-6; available at http://www.revue-chimeres.fr/drupal_chimeres/files/28chi02.pdf. 22For the seminars in question, see Jaques-Alain Miller, ed., The Seminar of Jacques Lacan, Book II: The Ego in Freud’s Theory and in the Technique of Psychoanalysis, 1954-1955 (New York: Norton, 1988), esp. chapters XV, XVI and XXIII. 23Ludwig von Bertalanffy, General Systems Theory (New York: George Braziller, 1969). Bertalanffy claimed to have elaborated his concepts before the war, but by his own admission (p. 90) it was only in the wake of cybernetics that the ideas of general systems theory gained hold in scientific discourse. 24Paul Watzlawick et. al., Pragmatics of Human Communication (New York: Norton, 1967). 25Félix Guattari, La Révolution moléculaire, op. cit., pp. 250-53 [English trans. pp. 88-90]. 26Félix Guattari, Chaosmose (Paris: Galilée, 1992), pp. 20-21; English translation by Paul Bains and Julian Pefanis, Chaosmosis: An Ethico-Aesthetic Paradigm (Bloomington and Indianopolis: Indiana University Press, 1995) pp. 7-8. 27Félix Guattari, “Presentation du séminare,” op. cit., p. 1. 28Ilya Prigogine and Isabelle Stengers, Order out of Chaos: Man’s New Dialogue with Nature (New York: Bantam, 1984/1st French ed. 1979). Also see the transcript of a conversation held in 1981 between Stengers, Prigogine, Elkaïm and Guattari, in Mony Elkaïm, If You Love Me, Don’t Love Me: Constructions of Reality and Change in Family Therapy (New York: Basic Books, 1990). 29Heinz von Foerster, “On Self-Organizing Systems and Their Environments” (1960), in Understanding Understanding, op. cit. 30See the introduction and first chapter of W. Brian Arthur, Increasing Returns and Path Dependency in the Economy (Ann Arbor: University of Michigan Press, 1994). 31The book that brought widespread awareness of the kanban system to the West was James Womack et. al., The Machine That Changed the World: Based on the Massachusetts Institute of Technology 5-Million-Dollar 5-Year Study on the Future of the Automobile (New York: Simon and Shuster, 1990). 32Jay Wright Forrester, Industrial Dynamics (Cambridge, Mass. : MIT Pres, 1961). 34See Benoit Mandelbrot and Richard Hudson, The (Mis)Behavior of Markets: A Fractal View of Risk, Ruin and Reward (New York: Basic Books, 20040, esp. chap. 11. 35Nigel Thrift, Knowing Capitalism (London: Sage, 2005), p. 44. 36W. Brian Arthur, Increasing Returns and Path Dependency in the Economy, op. cit., p. 12. 37Félix Guattari, “Modèles de contraine et modélisation créative” (April 1991), in Chimères 28, 1996. 39Félix Guattari, “Pour une refondation des pratiques sociales,” in Le Monde diplomatique (Octobre 1992); English translation by Sophie Thomas, “Remaking Social Practices,” in Gary Genosko, ed., The Guattari Reader (Oxford: Blackwell, 1996). 40Félix Guattari, “Ritournelles et Affects existentiels,” in Cartographies schizoanalytiques, op. cit., p. 254. English translation by Juliana Schiesari and Georges Van Den Abbeele, “Ritornellos and Existential Affects,” in Gary Genosko, ed., The Guattari Reader, op. cit., p. 160. 41Anne Querrien, “Les cartes et les ritournelles d’une panthère arc-en-ciel,” in Multitudes 34 (Fall 2008). 42Fernand Deligny, “Les Cartes” (1976), in Sandra Alvarez de Toledo, ed., Fernand Deligny: Oeuvres (Paris: Editions l’Arachnéen, 2007), p. 949. See also Jean-Claude Groshens et al., Cartes et Figures de la Terre, exhibition catalogue (Paris: Centre Georges Pompidou, 1980). 43Guattari refers to Varela in Cartographies, op. cit., p. 93, and in Chaosmose, op. cit., pp. 20 and 61 [English trans. pp. 7 and 39]. For an extremely rich discussion of the relations between the two, see Paul Bains, The Primacy of Semiosis: An Ontology of Relations (Toronto: University of Toronto Press, 2006), chapter 5. 45Ibid., p. 19 [English trans. p. 7]. 46For an historical insight into the inevitability of societal change after long economic downturns, see the article by Shimson Bichler and Jonathan Nitzan, “Contours of Crisis: Plus ça change, plus c’est pareil?” (December 2008), available at http://bnarchives.yorku.ca/256. 47Félix Guattari, Chaosmose, op. cit., p. 117 [English trans. p. 83]. 48Gilles Deleuze and Félix Guattari, Qu’est-ce que la philosophy? (Paris: Minuit, 1991), chapter 7. English translation by Hugh Tomlinson and Graham Burchell, What Is Philosophy? (New York: Columbia U. P., 1994), chapter 7. 49Johannes Willms, Conversations with Ulrich Beck (Cambridge: Polity Press, 2004), p. 16. This entry was posted on February 27, 2009 at 5:34 pm and is filed under 1. You can follow any responses to this entry through the RSS 2.0 feed. You can leave a response, or trackback from your own site. One elucidation–in order for “desire” to seek “infinity” there must first be concept of what is sought insofar as it is expressible. Spengler was very clear about the Faustian concept of “infinity”, seen in infinitesimal calculus and Gothic cathedral. Classical man had a completely different concept. Whatever temptation one has to define to apeiron in terms of the “infinite”, it is much more concrete and more “open” than it is conceptually unlimited. As mythos it is not inconsistent with either Parmenides or–ironically–Einstein’s relativistic universe. –> This is a very interesting comment, thanks a lot. I understand what you say about infinity, I did read Spengler long ago and those parts about calculus and about Baroque organ-playing in the acoustic space of cathedrals are really unforgettable. Nancy and Lacoue-Labarthe also made some important observations about the “infinitization” of the subject since Romantic times, in their book on the Literary Absolute. So I was thinking of this infinite desire/desire for the infinite, and how it is caught in capture-devices that ultimately become vast machinic apparatuses, a capitalistic noosphere of cables and wires, very much the work of Faust-as-engineer (the modernizing Faust who appears at the end of the second part of Goethe’s play). The question is how to deal with this bad infinity, how to deal with its ramifications in your own body and mind? Actually, the idea of this long text — but I am sorry, it is too long and this is probably unclear — is to point in the end to processes that act to singularize desire, so that instead of infinite deferrals and circulations, desire is able to gain concrete embodiment which is nonetheless open to something rather different from the infinite, namely the virtual, potentiality, which I guess is the potential to be actual, to be singular. This what I am looking for, and I think maybe what Guattari was looking for, an open finititude if you will. However I do not know anything about Penrose so maybe you can expand or suggest something I could read someday? This is a brilliant post from Brian Holmes on Guattari our struggle for sensible self-determination within and among the contemporary regimes of dominance. How are we to navigate such layered complexities which both afford our mode of existence as well as limit our possibilities? How are we to even begin to think this?